The NIC-9812AF-2SFP10G is a dual-port 10Gb Ethernet network adapter featuring the next generation BCM57810S single-chip solution from Broadcom in a PCIe 2.0 compliant form factor. Leveraging Broadcoms market-proven architecture and software, the NIC-9812AF-2SFP10G delivers full line-rate performance across all ports with low power consumption. The NIC-9812AF-2SFP10G 10G network adapter supports enterprise class features such as VLAN tagging, adaptive interrupt coalescing,MSI-X, NIC teaming(bonding),Receive Side Scaling (RSS), jumbo frames, PXE boot and virtualization features such as VMware NetQueue and Microsoft VMQ. 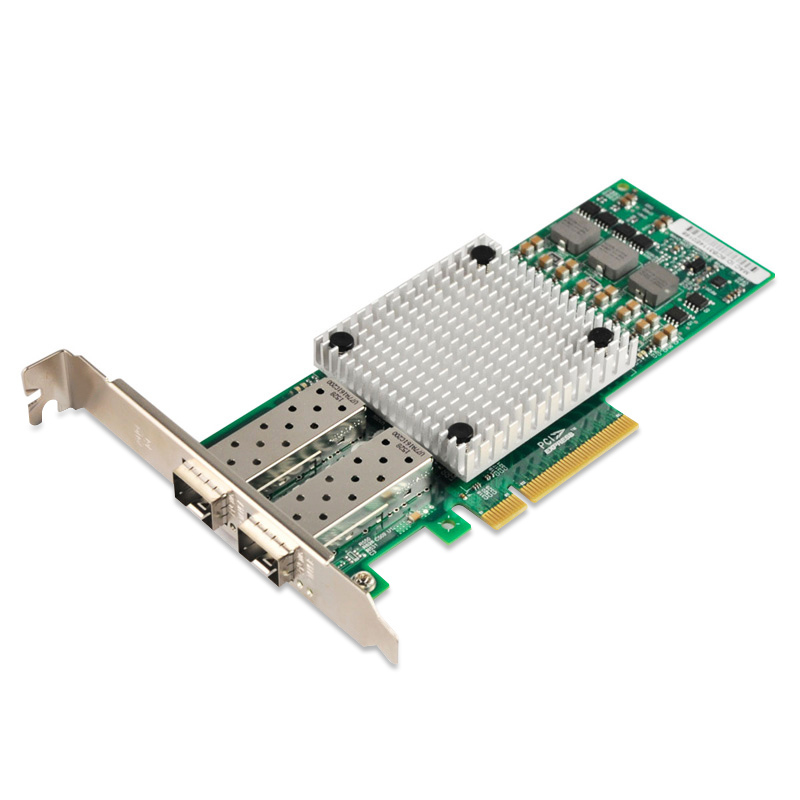 The NIC-9812AF-2SFP10G10G network adapter delivers 20Gbps full duplex Ethernet transfer rate per port (40 Gbps per adapter), providing the network performance needed to improve response times and alleviate bottlenecks that impact performance of next generation data centers.10Gb Ethernet bandwidth is ideal for high performance computing, database clusters, and more. The NIC-9812AF-2SFP10G adapter supports jumbo frames (also known as extended frames), permitting up to a 9K byte (KB) transmission unit (MTU) when running Ethernet I/O traffic.This is over 5X the size of a standard 1500-byte Ethernet frame.With jumbo frames,networks can achieve higher throughput performance and greater CPU utilization.These attributes are particularly useful for database transfer and tape backup operations. TCP,IP,UDP checksum offload,Large Send Offload (LSO),TCP,Segmentation Offload (TSO). These features optimize host efficiency, leaving the CPU available for other duties. The NIC-9812AF-2SFP10G Adapter by Broadcom offers TCP/IP stateless offloading capability. Message Signaled Interrupt (Extended) provides performance benefits for multi-core servers by load balancing interrupts between CPUs/cores. The NIC-9812AF-2SFP10G10G network adapter by Broadcom supports MSI and MSI-X. IEEE802.1Q virtual local area network (VLAN) protocol allows each physical port of the NIC-9812AF-2SFP10G10G network adapterto be separated into multiple virtual NICs for added network segmentation and enhanced security and performance.VLANs increase security by isolating traffic between users. Limiting the broadcast traffic to within the same VLAN domain also improves performance.The NIC-9812AF-2SFP10G10G network adapterprovides support for 802.1Q (VLAN). TCP/IP Offload Engine (TOE) shifts the processing of data in the TCP protocol stack from the server CPU to the adapters processor, freeing server CPU cycles for other operations. Single-Root I/O Virtualization (SR-IOV) provides a mechanism to bypass the host system hypervisor in virtual environments providing near metal performance and server efficiency. SR-IOV provides mechanism to create multiple Virtual Functions (VFs) to share single PCIe resources. The device is capable of SR-IOV, and requires Server BIOS support, controller firmware, and OS support. I/O Virtualization support for VMware NetQueue and Microsoft VMQ help meet the performance demands of consolidated virtual workloads. Normally the TCP Checksum is computed by the protocol stack. By selecting one of the "Checksum Offload" parameters, the checksum can be computed by the adapter. Segmentation Offload is technique for increasing outbound throughput of high-bandwidth network connections by reducing CPU overhead. The technique is also called TCP segmentation offload (TSO) when applied to TCP, or generic segmentation offload (GSO). RSS resolves the single-processor bottleneck by allowing the receive side network load from a network adapter to be shared across multiple processors. RSS enables packet receive-processing to scale with the number of available processors.The NIC-9812AF-2SFP10G10G network adapterby Broadcom has RSS capabilities. Synchronization of system clocks throughout a network, achieving clock accuracy in the sub-microsecond range, making it suitable for measurement and control systems.The NIC-9812AF-2SFP10G10G network adapterby Broadcom supports Precision Time Protocol-ready (PTP). The NIC-9812AF-2SFP10G10G network adapter support for NIC teaming helps IT administrators increase network fault tolerance and increased network bandwidth, The team of adapters can work together as a single virtual adapter. The NIC-9812AF-2SFP10G10G network adapter provides support for several different types of teaming enabling IT administrators to optimize availability, improve performance and help reduce costs. The NIC-9812AF-2SFP10G10G network adaptercan be administered from Insight Manager (SIM). The adapters can be managed individually or in teams, providing SNMP based statistics for reporting purposes. The NIC-9812AF-2SFP10G adapter can also be managed by other applications with SNMP support. The NIC-9812AF-2SFP10G10G network adapteris a validated, tested, and qualified solution. This approach provides a more robust and reliable networking solution than offerings from other venders and provides users with a single point of contact for both their servers and their network adapters. Each NIC-9812AF-2SFP10G10G network adapter ships with a suite of operating system-tailored configuration utilities that allow the user to enable initial diagnostics and configure adapter teaming. This includes a patented teaming GUI for Microsoft Windows operating systems. Additionally, support for scripted installations of teams in a Microsoft Windows environment allow for unattended OS installations. The colored LEDs on each port of the NIC-9812AF-2SFP10G10G network adapter indicate link status and link activity. PXE allows the server to boot over the network and download software residing in the network. VMware NetQueue is technology that significantly improves performance of 10 Gigabit Ethernet network adapters in virtualized environments. Windows Hyper-V VMQ (VMQ) is a feature available on servers running Windows Server 2008 R2 with VMQ-enabled Ethernet adapters. VMQ uses hardware packet filtering to deliver packet data from an external virtual machine network directly to virtual machines, which reduces the overhead of routing packets and copying them from the management operating system to the virtual machine. Data Rate: Two ports, each at 20 Gbps full duplex; 40 Gbps aggregate full duplex theoretical bandwidth.